Directorate General of Medical Service DGMS job circular 2017 has been published at http://www.mod.gov.bd/. 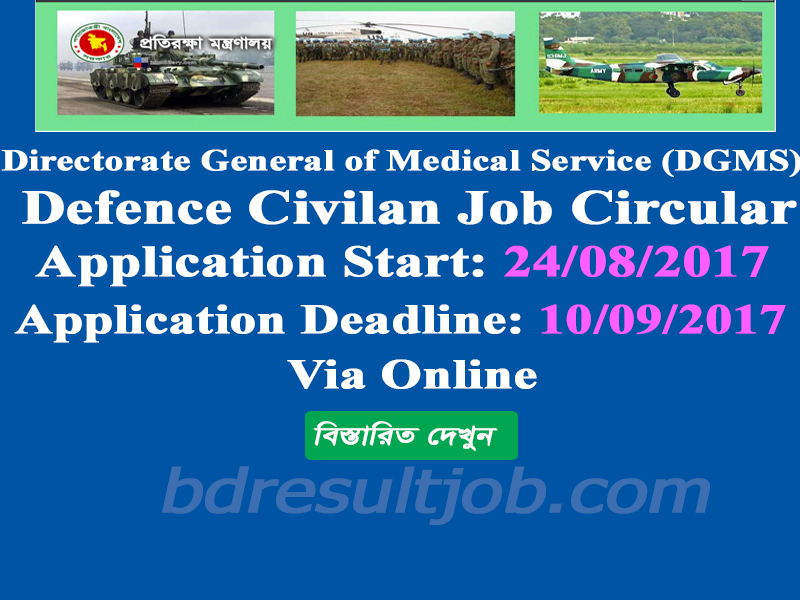 Directorate General of Medical Service DGMS jobs Apply online start on 24 August 2017 and Deadline 10 September 2017 at http://dgms.teletalk.com.bd/apphome.php. 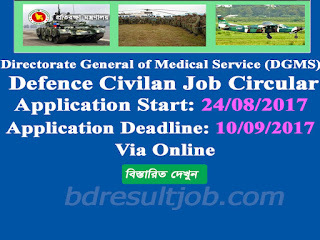 Directorate General of Medical Service DGMS Bangladesh defence civilian job will recruit some personnel for various post. Bellow you have to see the details about this job circular. Online application must be through http://dgms.teletalk.com.bd/apphome.php. a. Principal Reaserch officer (CGO-1): vacancies 1, Educational Qualification and salary: please see advertisement. b. Senior reserch officer(CGO-1): vacancies 1, Educational Qualification and salary: please see advertisement. c. DADGMS(CGO-1): vacancies 01, Educational Qualification and salary: please see advertisement. d. Administration Officer(CGO-1): vacancies 01, Educational Qualification and salary: please see advertisement. e. Photomicrographer(CGO-1): vacancies 01, Educational Qualification and salary: please see advertisement. f. Statistics(CGO-1): vacancies 01, Educational Qualification and salary: please see advertisement. g. Curator(CGO-1): vacancies 01, Educational Qualification and salary: please see advertisement. h. Entomologist(CGO-1): vacancies 01, Educational Qualification and salary: please see advertisement. i. Designer(CGO-1): vacancies 01, Educational Qualification and salary: please see advertisement. j. Assistnt librarian(CGO-2): vacancies 01, Educational Qualification and salary: please see advertisement. k. Accountant(CGO-2): vacancies 01, Educational Qualification and salary: please see advertisement. l. Catalouge(CGO-2): vacancies 01, Educational Qualification and salary: please see advertisement. m. Artist(CGO-2): vacancies 01, Educational Qualification and salary: please see advertisement. 6. Candidates must be Bangladeshi by born. i. Principal Research officer 40 (forty) as on 01/08/2017. ii. Senior Reserch officer 35 (thirty five) as on 01/08/2017. and select your position which one you want to apply. Tags: DGMS written exam result and viva result 2017. DGMS admit card download at www dgms teletalk com bd. Directorate General of Medical Service DGMS job circular notice. Directorate General of Medical Service DGMS job written exam date and time, admit card download, seat plan information. Finally DGMS exam result, viva schedule and viva voce result.bangladesh army Civilian circular 2017. defence civilian job circular 2017.